Yep, the bestie is pregnant and I am so excited I finally get to share the secret! She texted me one afternoon and asked if she could come over because she had something for me. I was just cooking so I told her to come on over. For the life of my I couldn't figure out what she had of mine, or would be bringing by. When she showed up she was acting a little funny, so I finally asked her what was up and she threw this at me. I unfolded it to find that it was a onesie made just for ME! We screamed and jumped up and down after I read it! So happy for John and Rebekah and cannot wait to meet this beautiful baby in October! 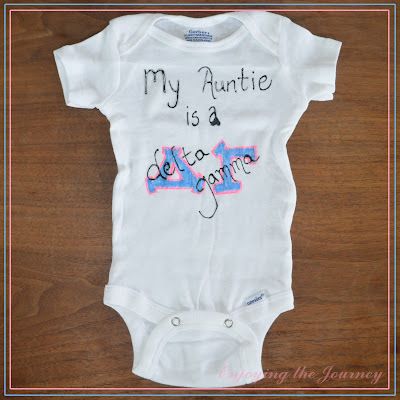 And if you didn't already know, I'm a Delta Gamma. 1. Stop by Rebekah's blog and congratulate her! 2. Add this sweet baby and family to your prayer list and let's start praying for this little one together! I will be taking off the next couple of weeks because of some crazy deadlines at work, it's time for a little break, and my brother's upcoming wedding on the 21st! and see how I'm Enjoying the Journey! Enjoy your blog vacation and try not to stress too much! This is so cute!! Enjoy your break!